Proof is a 2000 play by the American playwright David Auburn. The play premiered Off-Broadway in May 2000, and transferred to Broadway in October 2000. The play won the 2001 Pulitzer Prize for Drama and Tony Award for Best Play. The next day, Claire, Catherine's sister who just flew in from New York is setting up a large brunch for them in the backyard. Catherine enters and Claire tries to goad her into idle chitchat as Catherine quietly seethes. Claire declares she's getting married and invites Catherine to stay with her and her fiance in New York. Catherine assures her she'll come in February for the wedding, but Claire keeps pressing her to go earlier. When Catherine demands to know why Claire is inundating her with questions, Claire tells her the police came over earlier to check in on Catherine. Catherine admits to calling the police the previous night and tries to explain her altercation with Hal but only ends up sounding unhinged to the dubious Claire. Hal appears and asks to continue his work sorting the notebooks. Catherine lets him inside and Claire drops a hint for Catherine to try flirting with Hal by offering a bagel. Catherine storms into the house. Catherine - A young woman, 25 years old, who inherited much of her father's mathematical genius, and, she fears, his "instability" as well; she gave up her life and schooling to take care of her father until his recent death. Claire - Catherine's older sister, a practical and business-minded woman who has been comfortably successful in her work and relationships. She left Robert and Catherine behind, distancing herself from the run-down family home of her youth. She left the family to make a new life for herself in New York City. Robert - A recently deceased mathematician praised for his groundbreaking work in his youth, but whose later years were plagued by delusional mental illness; he is seen in Catherine's imagination and in flashbacks. Harold (Hal) Dobbs - One of Robert's last Ph.D. students during the one year his idol and mentor's illness went into remission, at least enabling Robert to teach, if not continue his own creative mathematical work. Originally produced by the Manhattan Theatre Club, opening on May 23, 2000, the play transferred to Broadway at the Walter Kerr Theatre on October 24, 2000. Directed by Daniel J. Sullivan, the production starred Mary-Louise Parker as Catherine, Larry Bryggman as Robert, Ben Shenkman as Hal, and Johanna Day as Claire. Later during the Broadway run, Jennifer Jason Leigh (September 13, 2001 to June 30, 2002) and Anne Heche (as of July 5, 2002) took over the lead role. Josh Hamilton and Neil Patrick Harris subsequently played the role of Hal. Mary-Louise Parker won the Tony Award for her performance, and Daniel Sullivan won the Tony Award, Best Direction of a Play. The play closed on January 5, 2003 after 917 performances. 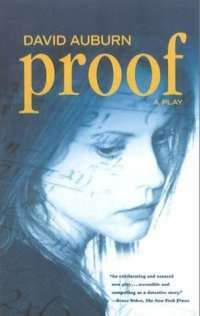 Proof premiered in the West End at the Donmar Warehouse in May 2002 to June 15, 2002. Directed by John Madden, the cast starred Gwyneth Paltrow as Catherine, with Ronald Pickup as Robert, Sara Stewart as Claire, and Richard Coyle as Hal. London's Menier Chocolate Factory produced the play from March 13, 2013 to April 27, 2013. It featured Mariah Gale in the role of Catherine and Polly Findlay directed. In April and May 2013, a new production by the Whitmore Eclectic Theater Group opened in Los Angeles at the Hayworth Theatre for a limited run. James Whitmore Jr., son of the award-winning iconic actor James Whitmore, stars and Aliah Whitmore, his daughter directed. ↑ Jones, Kenneth. "Broadway's Proof, of Math, Memories and Mary-Louise Parker, Opens Oct. 24". Playbill.com. Retrieved 31 July 2015. ↑ Matthew Amer (29 January 2013). "Gale has Menier Proof". Official London Theatre.